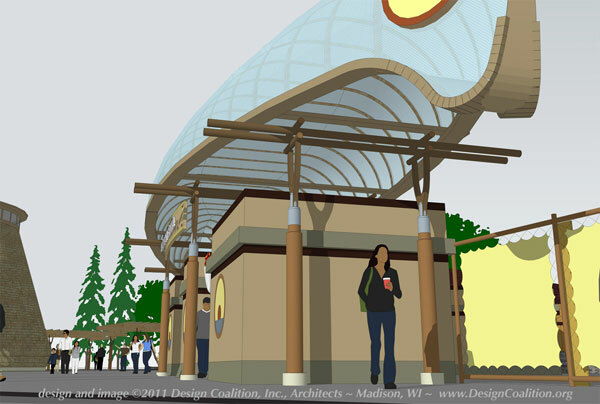 In early 2011, Northwoods NiiJii Enterprise Community, Inc. held a national design competition to create a concept for Native arts and cultural space. 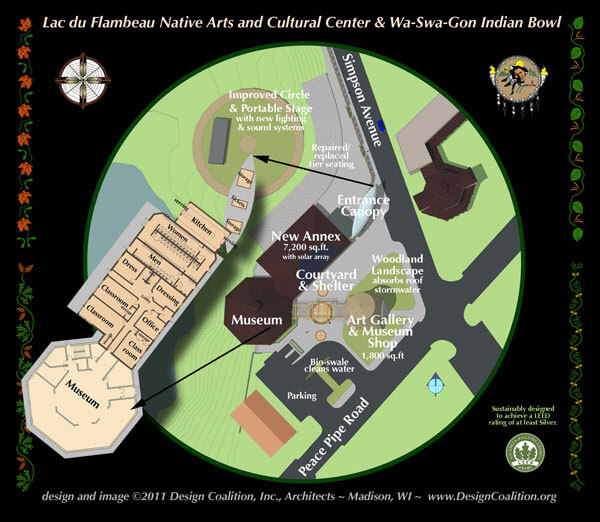 Located in downtown Lac du Flambeau, a Northern Wisconsin town on the shore of Pokegama Lake, the site currently includes the historic Indian Bowl and the George W. Brown, Jr. Ojibwe Museum & Cultural Center. Design Coalition's entry was selected as the winning design. Lou Host-Jablonski was familiar with the site and with the tribe's efforts to improve it from some years earlier. He had worked with a team from the University of Wisconsin School of Landscape Architecture that included Dr. Sue Thering and Shawn Kelly, FASLA on a design charette for an area of the downtown. Left: Aerial photo of the existing site. 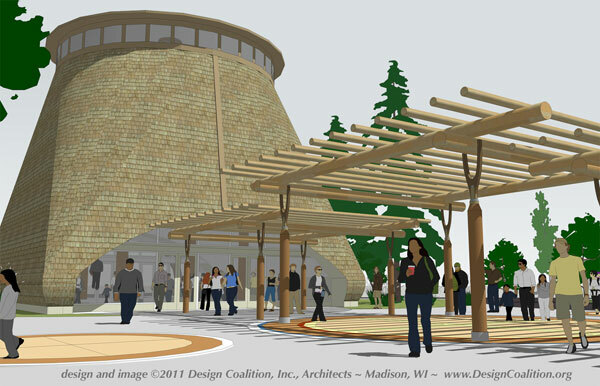 • New art gallery and museum shop -- an iconic form drawn from the elegant shape of traditional Ojibwe birch bark storage vessels. • A new annex with 3 classrooms, dressing rooms for performers, expanded kitchen and toilet rooms, and an administrative office. • Site design that includes an "art courtryard" with architectonic versions of traditional shade structures, extensive native vegetation, and bio-swales to clean and absorb stormwater from the paving. 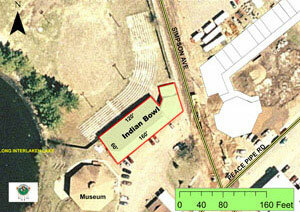 Above: Proposed site plan for the new facility. Below: View of new museum annex and art court. Above: Main entrance to Indian Bowl with canopy. with mural fencing at right. Above: Art Gallery and Museum Shop, built of locally-grown wood. 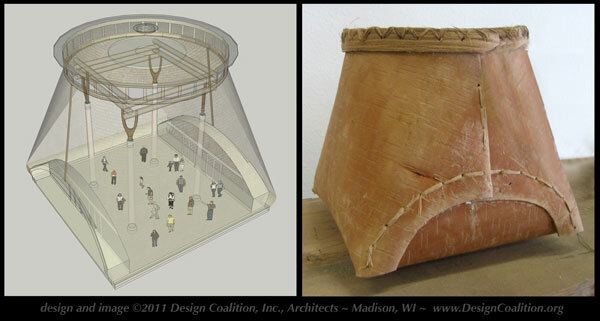 Below: "See-thru" view of Art Gallery & Museum Shop concept, inspired by Ojibwe traditional bark basket. Funding for the competition was provided via a LINC/Ford Foundation Space for Change Pre-Planning grant. To visit the websites for Northwoods NiiJii and Lac du Flambeau Tribe, click on their logos below.